A work by Emilio Isgrò – yet another donation of the Amici degli Uffizi to the Gallery – has joined the self-portrait collection. 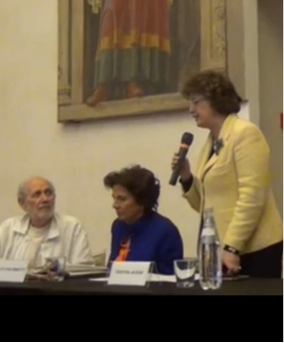 I was fortunate to be staying in Florence while this new achievement of our sister organization Amici degli Uffizi was presented on May 16, 2014. It was really exciting to be invited by our President, Countess Maria Vittoria Rimbotti, to the very crowded press conference in San Pier Scheraggio for the official donation to the Uffizi Gallery of the work created in 1971 by conceptual artist Emilio Isgrò, titled “Dichiaro di non essere Emilio Isgrò” (I declare not to be Emilio Isgrò). Isgrò is one of the most important contemporary artists, famous for portraying himself “by subtraction” and self-denial. 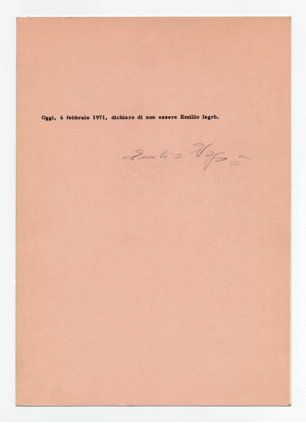 This donated work consists of an installation of seven sheets of silkscreen paper, on which the artist quotes statements pronounced by himself or by his family and denying his own identity. After the presentation, I joined the group of friends of the museum milieu, for a Luncheon hosted by Countess Rimbotti in the garden of her Villa in honor of the artist.